A diamond is a beautiful stone regardless of size, shape, or placement, but when sizing an engagement ring on a finger, each stone needs to be taken into consideration. Obviously, hand sizes and finger widths can be different, so understanding how a ring will look from an image is a complex matter. To help, we’ve provided a brief explanation of the factors at play, as well as a few pictures of differently sized rings being worn so you can visualize how a ring might look on you. These calculations below are based on the average finger size of 6.5 which equals 16.9mm (or 17mm to make the math easier). If your finger is larger than a size 6.5, the diamond will look a little smaller than described below. If your finger is smaller than a size 6.5, your diamond will look larger than described in each description below. 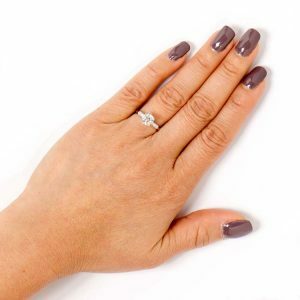 Assuming that the average finger width (based on a size 6.5 finger size) is 17mm, a 0.50-carat diamond will appear to cover 30% of the width of the finger. A round-cut 0.50-carat diamond has a width of 5.2mm. The 0.50-carat diamond is the smallest diamond that is typically used in a solitaire mounting. In general, our jewelry experts always recommend setting diamonds under 0.70-carats with a halo of diamonds surrounding it. To view our collection of 0.50-carats please click here. Assuming that the average finger width is 17mm, a 1-carat diamond will appear to cover 38.2% of the width of the finger. A round-cut 1-carat diamond has a width of 6.5mm. The 1-carat diamond has enough size to typically look noticeable on the finger. It is usually the starting milestone size for anyone looking to get a serious diamond. The 1ct diamond covers more than 1/3 of the width of the finger. To view our collection of 1.50-carat engagement rings, click here. Assuming that the average finger width is 17mm, a 1.50-carat diamond will appear to cover 43.5% of the width of the finger. A round-cut 1.50-carat diamond has a width of 7.4mm. As you can see in the photo below, the 1.50-carat is already considered a comfortably sized diamond. It is still very popular for 1.50-carat diamonds to be surrounded by a halo of diamonds, but 1.50 is already large enough for the center diamond to stand proudly on its own. To view our collection of 1-2 carat engagement rings, click here. 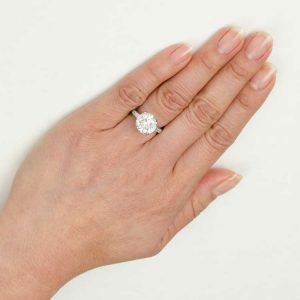 Assuming that the average finger width is 17mm, a 2-carat diamond will appear to cover 48.2% of the width of the finger. A round-cut 2-carat diamond has a width of 8.15mm. The 2-carat engagement ring fills up almost the width of half the finger. It is prominent and bold. Like the 1.50-carat diamond, it doesn’t need a halo, but a halo will still add to the 2-carats presentation. Click here to view our collection of 2-3 carat engagement rings. Assuming that the average finger width is 17mm, a 2.50-carat diamond will appear to cover 51.4% of the width of the finger. A round-cut 2.50-carat diamond has a width of 8.70mm. The 2.50-carat diamond will fill up more than half the width of your finger. This sized diamond is already considered large. A halo would add to the diamond, but is necessary at all to add to the illusion. Click here to view our collection of 2.50-carat engagement rings. Assuming that the average finger width is 17mm, a 3-carat diamond will cover 55.3% of the width of the finger. A round-cut 3-carat diamond has a width of 9.35mm. The 3-carat diamond is a beautiful size. It’s notable but not flashy. It’s the perfect size for someone who wants to have a prominent sized diamond ring, without looking gaudy or ostentatious. View our collection of beautiful 3-carat engagement rings. 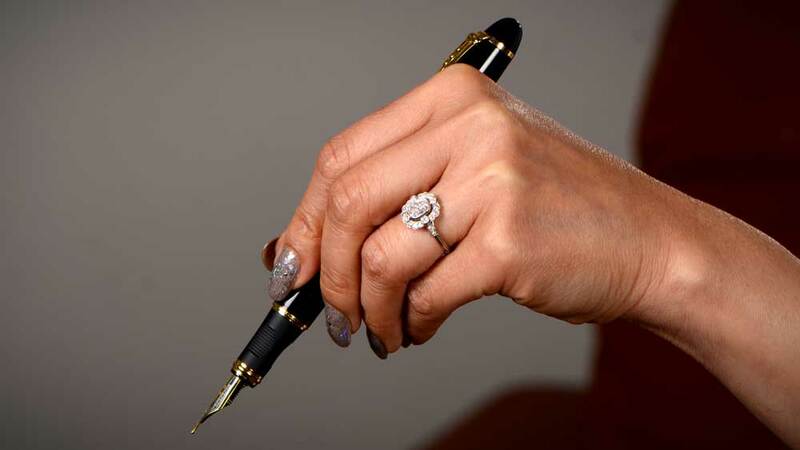 Assuming that the average finger width is 17mm, a 5-carat diamond will cover 64.5% of the width of the finger. A round-cut 5-carat diamond has a width of 10.90mm. A 5-carat diamond is large and stunning. 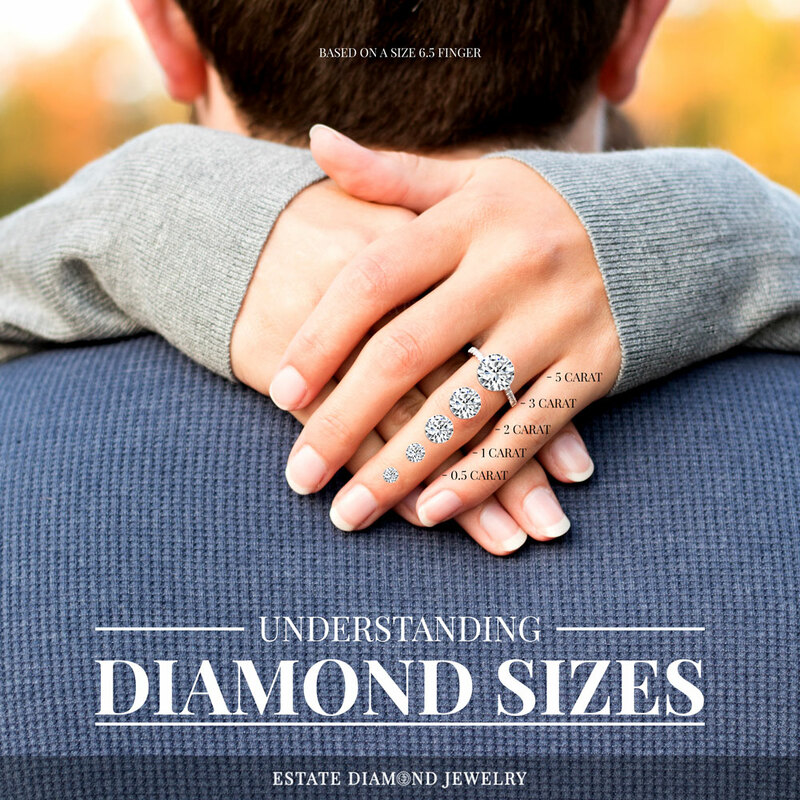 This diamond size in not for someone unassuming who wouldn’t want anyone to notice their ring. It won’t cover your entire finger (an 18-carat diamond will), but it will look bold and lovely. Click here to view our 5-carat engagement rings. Diamonds are measured in carats, which refer to the weight of the stone. One carat is approximately one-fifth of a gram or 200 milligrams. Diamond carats are typically measured in increments of 0.25. A stone could measure anywhere between a fraction of a carat to multiple carats. Unfortunately, those numbers are somewhat meaningless until you can see the stone in an engagement ring on a finger. A vintage solitaire engagement ring traditionally consists of a single stone in a simple mounting. The solitaire ring focuses all the attention entirely on the beauty of the diamond. Some prefer to adorn a single diamond with smaller stones to create a halo. 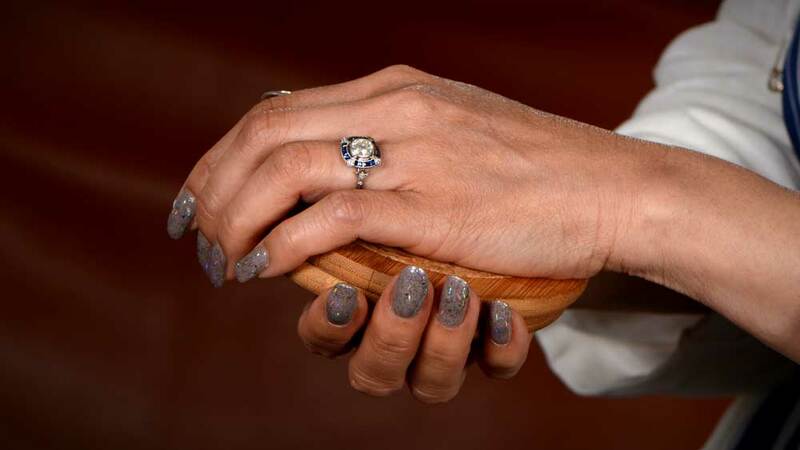 Halos give an increased sense of size and brilliance when looking at the engagement ring on a finger. Diamonds can also prong-set or bezel-set. A prong set ring is held in place with small metal prongs and bezel-set rings are encased in metal. The popular, prong-set, single solitaire vintage engagement ring was first popularized by Tiffany and Co. in the 1880s. A bezel setting will run around the entire perimeter of the diamond. Cost, style preference, and of course, an individual’s finger dimensions all naturally factor into the decision when buying a ring. That’s why seeing an engagement ring on a finger is much more useful than looking at loose stones or pictures of jewelry when shopping for engagement rings. To help you visualize how some commonly sized rings would look on your finger before you enter the showroom, we’ve included the images below. Of course, the best way to determine how an engagement ring will look and fit on your finger is to try it on in person. Visit us at our showroom in midtown New York, or try out our home viewing program, and we’ll be happy to help. Everyone’s finger size is different. Something as simple as the shape of your hand may change the illusion of the size of the diamond on your finger. If you want to know with certainty how large a particular diamond ring will appear, you will need to try it on. You can share this image below on Pinterest. Have any comments? Feel free to comment below!